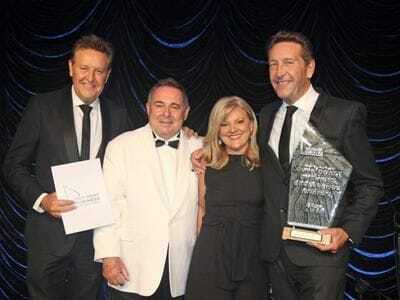 The company, which is headed up by brothers Andrew and Greg Bell, received the award at the Gold Coast Business Excellence Awards gala dinner attended by 650 of the city's business leaders at The Star on Saturday night. The company, which launched on the Gold Coast in December 1989, now has 15 offices and employs 270 people across its 24 divisions. Gold Coast Business Excellence Awards president Ian Cousins said The Ray White Surfers Paradise Group was an outstanding company. "In its day-to-day operations the company consistently promotes the Gold Coast as a business and residential destination of choice to people throughout Australia and overseas,'' said Mr Cousins. 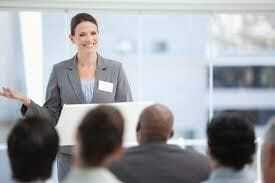 "They hold annual property related events such as the 'Event Auction' which is Australia's largest single day property event, the Gold Coast Home & Living Expo, and the Landlord Symposium. "They also do an incredible job of giving back to the community with the company's annual gala ball and charity auction so far having raised more than $3 million for the Muscular Dystrophy Association." The Ray White Surfers Paradise Group was also named as the annual winners of the Professions and Business Services Award. 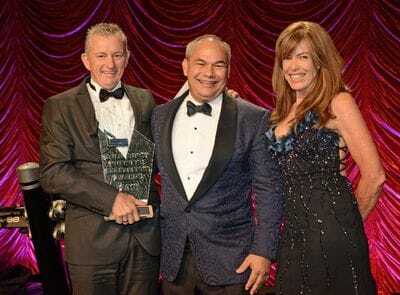 The company was not the only real estate business to claim on the major honours with John Henderson Professionals Mermaid Beach, which is owned by the Henderson clan, taking out the Family Business of the Year award. The city's IT sector was also in the spotlight during the night with three annual winners coming from that sector. Cloud computing specialists GCOMM took out the IT, Knowledge Management and Digital Services Award, online sales specialist Experience Oz won Tourism, Hospitality and Events Award and event management software developer iVvy won the Mayor's Innovation GC award. In other categories, Orbitz Elevators was named the Emerging Business of the Year, coffee shop franchisor Crema Espresso claimed the Retail, Wholesale and Distribution category, earth-moving equipment manufacturer Digga Australia won the Manufacturing title, Condev Construction romped away with the Construction and Trades trophy, functional foods company Morlife was victorious in Health and Wellbeing and Patriot Campers towed away the Encouragement Award. The GCBEA's major supporters are KPMG, The Graphic Design Company, Document Solutions Australia, Bloomtools, Consulting Hall, The Star Gold Coast, Regina King Photography, Bruce Lynton Land Rover Jaguar, Bond University and Dreamweavers.